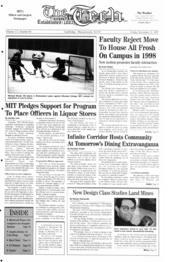 The entire MIT community will be invited into the Infinite Corridor tomorrow, not to get to class indoors or cut across campus, but to eat and celebrate. The Infinite Buffet, which will take place in the Infinite Corridor and nearby lobbies from noon to 2 p.m. tomorrow, is sponsored by the President's office. It will feature cuisines to tempt all palates, from traditional Southern fried chicken to delicacies from around the world. The goal of this "uniquely MIT" event is to "bring all members of the MIT community together to celebrate the good things about MIT," according to Associate Dean and Director of the Public Service Center Emily B. Sandberg, one of the event's organizers. Recognizing that the past semester has been a particularly difficult one for everyone on campus, President Charles M. Vest said that he thought "it would be great to have an event to bring MIT together in a positive, celebratory manner." No fine dining experience would be complete without entertainment, so the Infinite Buffet will also offer the sounds of a jazz quartet and a steel drum band, in addition to the antics of the MIT Beaver mascot and other performers. In honor of the event, Lobdell Food Court will be closed all day, according to Kathy Richmond, Marketing Manager for Aramark. However, Networks will be open all day, serving breakfast, lunch, and dinner. The planning of the event began about three weeks ago, when Vest and Dean of Students and Undergraduate Education Rosalind H. Williams heard from students that morale was generally down. Given that the end of the term is always tough, Vest and Williams decided that a community building event would be appropriate. Vest and Williams then contacted Anthony J. Ives G, Assistant Dean Katie O'Dair and Sandberg because of their extensive contact with students and event planning experience. "With all the students that come through the Public Service Center, I can say that I know students very well," Sandberg said. The team began to meet with a small group of PSC staff and students to discuss possible ideas. "We wanted to do something uniquely MIT that everyone could enjoy," said Sandberg. Thus the idea of an Infinite Buffet. "Everyone loves free food," she said. The team came up with a proposal and budget, which was approved by Vest and Williams. "Even the president has a few discretionary dollars in the budget, so I was pleased to fund this," Vest said. "I've never had to plan an event so intensively and quickly before, but it's all worth it," Sandberg said. "It's been really neat seeing so many groups on campus - [the Campus Activities Complex], [Residence and Campus Activities], Physical Plant, etc - come together to work on this," Ives said. The Infinite Buffet is not the first community-building event at MIT. Until several years ago, the entire MIT community, including living groups, staff and faculty, would form teams to participate in Johnson Games, a sort of field day held annually at MIT. However, attendance began to dwindle because the event required a full-day commitment, Sandberg said. "I have high hopes that this will be a wonderful event," Vest said.